Colorado Refugee Connect » January 19th Birthday Celebration – Volunteers Needed!! 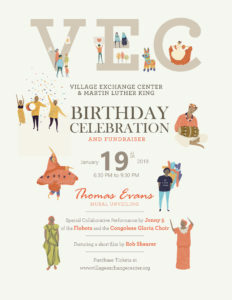 Join the Village Exchange Center on January 19 from 6:30 – 9:30 pm as we celebrate our birthday and honor the legacy of Dr. Martin Luther King! The event will feature food from around the world, a collaborative performance by Jonny 5 from the Flobots and the Congolese Gloria Choir, as well as a Thomas “Detour” Evans mural unveiling! Event Set-Up – Volunteers are needed to help us set up and get ready for this special event. Greet and Register Guests – Volunteers are needed to help us greet and register guests as they arrive. This entails welcoming people as they arrive at the door, guiding them to a welcome desk where they may sign in and then helping them to find their tables. Table Hosts – Because this event is our very first fundraiser, having a great team of volunteers to host tables is key. Volunteers serving as table hosts will be in charge of one to two tables, and will collect donations, answer basic questions and help ensure the overall flow of the evening goes smoothly. Event Clean-Up – While we do work with professional cleaners, we would be grateful for volunteers to help in breaking down tables, putting away chairs and other general clean up tasks. Throughout the event, the Village Exchange Team will be available to greet, orient and guide each volunteer.